The compilation, Bookmaking on the Distaff Side, was printed as a showcase for the contributions of women to printing and the book arts. In addition to Jane’s humorous "Typographic Discourse" and "The Punctuation Pets," by Ruth Douglas Keener, the volume included a serious history and bibliography, and essays on women calligraphers, papermakers, and typesetters. 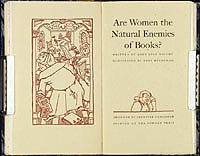 "Are Women the Natural Enemies of Books?" was written in refutation of an 1881 essay by Andrew Lang, in which he wrote that "Women [are] the natural foes of books," putting them in the same class as damp, dust, dirt, bookworms, careless readers, borrowers, and thieves. Bookmaking on the Distaff Side. New York: Distaff Side, 1937. A California Gold Rush Miscellany, with explanatory text by Jane Bissell Grabhorn. 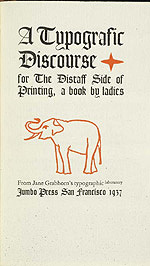 San Francisco: The Grabhorn Press, 1934.